This year we goofed off on a few shorter trips within the British Isles, rather than doing one long summer-dominating foreign adventure to a place where I don’t know the language. 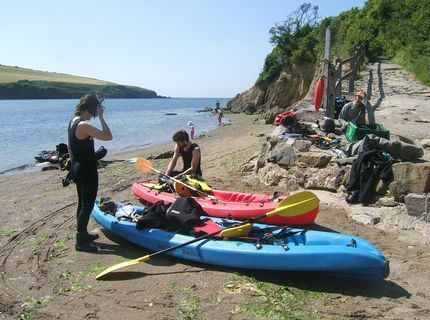 Becka was going to an experimental psychology conference in Plymouth, so we planned to take the kayaks down for a spot of diving. I used to visit the area a lot when I was in university with my old diving club, the UBUC. 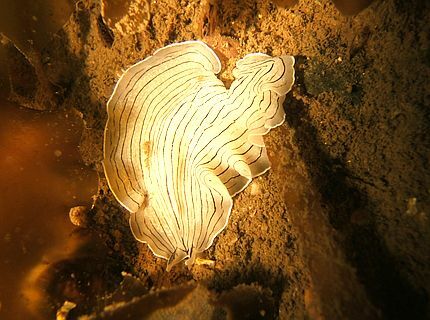 Making ready on the nice cobbled beach at Babbacombe near where I photographed this candy stripe flatworm. 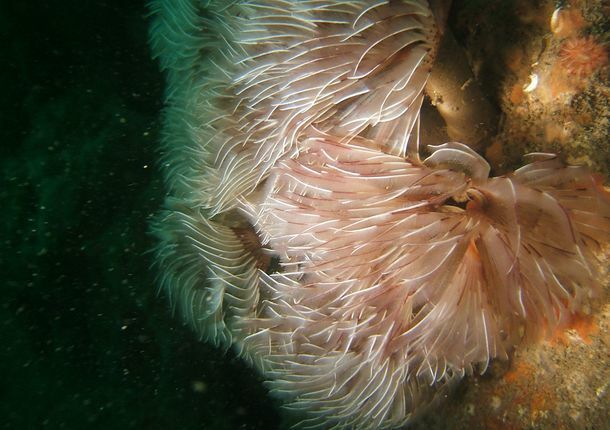 My camera flash is broken, so all underwater shots are taken by torch-light and are usually blurred. Since we didn’t have a car, I negotiated the hire of a van with a roof-rack for a minimum of ten days to put it in range the mileage limit of 72 a day. Then the summer heatwave struck, and a friend of ours decided he needed a new car to go with his new baby because the old one didn’t have air-con. This was that one week in England where it was possible to use it. Funny how people still retain enough sense not to install air-con in their houses. We bought his old one which already had new brakes. Becka got it insured. My “no-claims” bonus has long been forgotten by the insurance industry. If you don’t keep up a regular subscription, they treat you as if you have crashed. We headed down to Bristol and stayed overnight with a friend, arriving after everyone had gone to bed, and leaving before most of them got up. I’ve had thefts from cars from here overnight, so I slept fitfully on the floor in the front hall with the door slightly ajar to avoid unpacking the whole lot. Having to worry about a car loaded to the ceiling with nickable stuff is one of the drawbacks of this type of holiday. You get used to the routine of shoveling kit from place to place, setting up your tent in a campsite and filling it with spare equipment before going somewhere else to do something. The last day is always the inconvenient one, because you have to pack everything up in the car, and then you’ve got no room and look like a shop on wheels. First stop: Babbacombe Bay. I remember it as a fun shore dive back in 1992, in the dark ages before dive kayaks were invented. There was a note on my road atlas about the point on the north side of Hope’s Nose (the headland dividing Tor Bay from Babbacombe) being excellent as well as possible to dive from the shore after a long walk. It used to be a no-go area due to the sewage outfall, now cleared due to the EU’s insistence that we no longer treat the ocean as a national toilet. Unfortunately, the rocks were packed with sea anglers casting their lines many metres out into the water, and we couldn’t approach it. We paddled past, out into the howling southerly wind and reached the Ore Stone, a 60m tall island one kilometre off-shore with no means of landing whatsoever. We sheltered for a few minutes in a large sea-cave on the north side, then came out and were blown back to shore. Becka was getting impatient to dive, and I didn’t know where to go. There was quite an impressive current as well as the wind, and I didn’t want something to go wrong on the first day. I didn’t want it to go wrong on any of the days, but losing your way on the first is a particularly poor show. 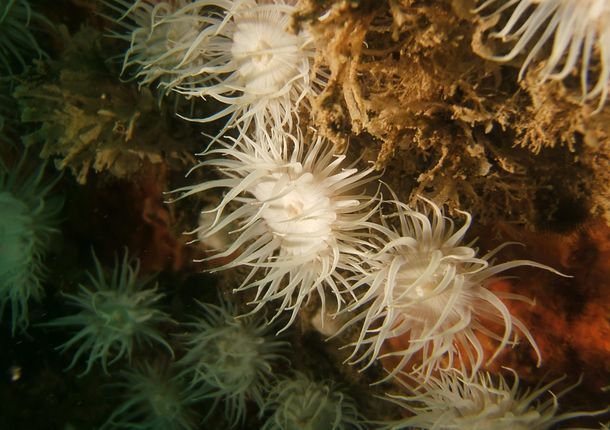 Pure white Actinothoe sphyrodeta anemones forming small colonies on the corners of rocks near Burgh Island. I hunted for some place else along the coast away from the fishermen. I had a portable sonar stick on loan from the club. It was thesize of a torch, and all you had to do was dip it in the water, press a button, and then read the result. Much easier than dropping an anchor on a string. The depths, even very far out from the shore, were no more than nine metres — not very deep. I picked a spot, tossed the anchor, thought it had caught something, but it was in fact ploughing through flat grey mud. There was nothing to see except a few crabs and worms. We picked up the anchor and swam with it towards the shore where there would at least be some form of interesting life on the rocks. After 20 minutes we gave up. I climbed into my boat, pulled the anchor in, and tried to paddle, towing Becka’s boat with Becka still in the water and kitted up. That didn’t work. I got out, helped to push her up onto her boat so she lay broadside across it with her tank still on her back. I barely made any headway against the wind. Note to self: always de-kit properly, even for a journey of 50 metres. We pitched in, swam the rest of the way underwater, found the cliff rocks on the shore, and the dive was fine with lots of fish and a couple of sea-fans. It’s strange: on land when there is soil there is a lot of life, plants, trees, hedgehogs, slugs, while the exposed rocks are pretty barren. Underwater it’s the opposite way round. There’s nothing to speak of on mud or sand, and all the action takes place on the rocks, or on wrecks that have fallen onto what was otherwise a barren place, like an oasis in the desert. The beach cafe was closing when we got back, but Becka persuaded them to sell us one slice of expensive cake before they locked up. Then, following the guidebook, we went north to Watcombe Head where there was supposed to be an underwater cave so big you could drive a bus into it. The red sandstone coast was pretty attractive, but the water did not go deeper than eight metres no matter how far you paddled out and and risked getting caught by the wind. The diving was rubbish and was quickly aborted. Our university digs for the duration of the conference. 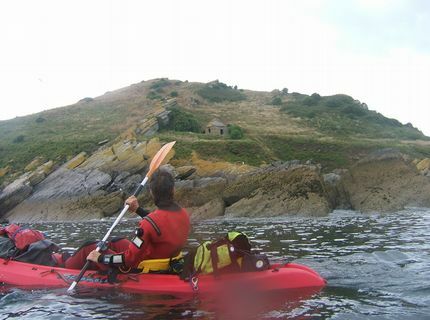 Later on we paddled past a little house on the Mew Stone. 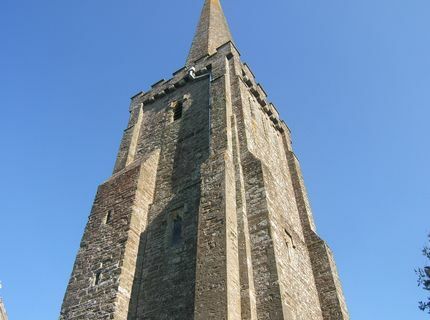 According to the guidebook, someone was sentenced to live on it for seven years without setting foot on the mainland. Obviously, he couldn’t eat grass, so must have kept goats to eat it for him, though there doesn’t seem enough wood to cook the goats. And so we went towards Plymouth. 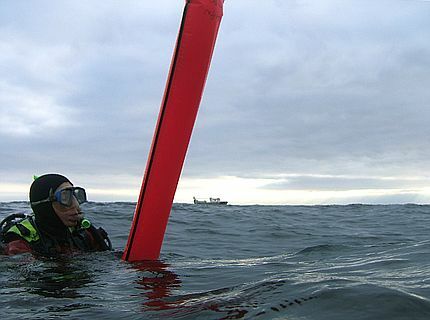 One of my ambitions was to kayak dive the James Eagan Layne wreck, which looks like it is in range. We drove to Whitsand Bay, descended one hundred metres of coastal cliff, and watched surfers who looked like they were being battered against the rocks. It was still a south wind. 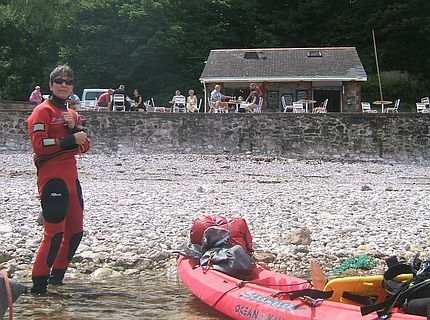 The most accessible place was Cawsand Bay. 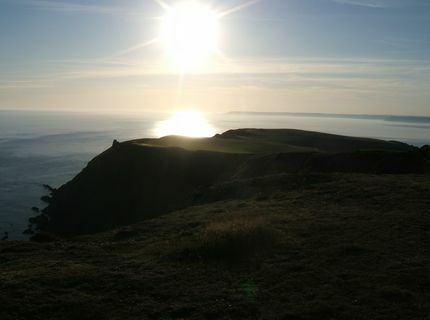 We launched from among the picnickers and made our way to Rame Head. Depths were less than seven metres everywhere, even out in the big scary waves. 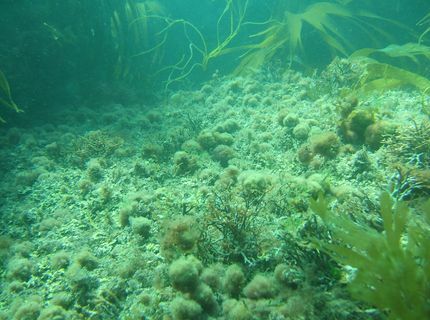 We tucked in and tried a dive, finding only kelp and sand. Then we tried back in the calmer waters of the bay where there were, surprisingly, some boulders. Which didn’t prove particularly interesting. It was now Sunday evening and we had scored one for four. 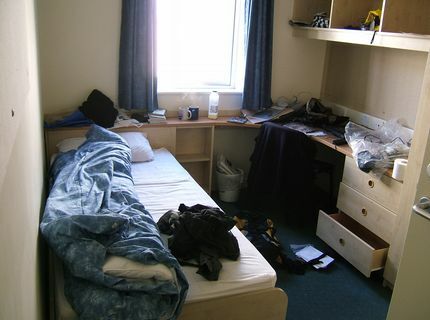 Time to move into the university accommodation and check out what we could get away with: stashing all our wet stuff and both ourselves into a room hired for one. Students these days seem to have en suite bathrooms which waste valuable storage space. It’s not like they can’t use public lavatories the rest of the day when they are at work or at the sports centre. Maybe the builders insist on providing this which they don’t need, so they can charge a higher premium for it, when they don’t actually have a choice. Profit is the only maximized variable in the calculation. We shared the shower with the paddles. 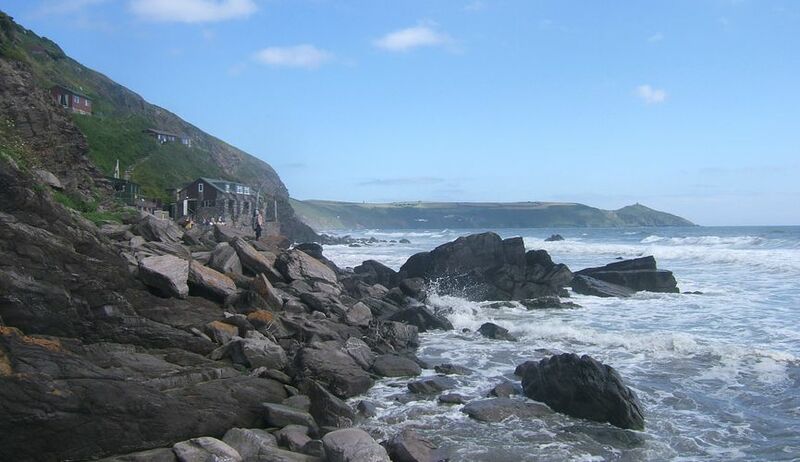 At the foot of the cliffs of Whitsand Bay. The surfers are behind me, but in roughly the same terrain. The James Eagan Layne is sunk between here and the headland. Becka did her important stuff at the conference, while I pottered around with my work, visiting the free wifi internet cafe for a minimum of two hours a day, doing some food shopping, filling the air tanks, and getting a new roof-rack. Becka had read a police warning in the paper, and was unimpressed with my improvised attachment of the roof-bars to the roof-rails by a very tightly wound bungee cord that locked it completely solid. I went to a few talks, but nothing sticks in my mind. I cycled round Plymouth a bit, checking out a legendary shore-dive at Devil’s Point which takes you out into the channel where all the military ships and submarines pass on their way into Devonport. I’d have to know more about this before I risked crossing the path of the Ministry of Bombing; they’re quite busy now defending the oil interests on which they rely to power their warships. Wrecks from past naval adventures litter the coastline, but being as they were usually huge wooden sailing ships, there is not much left of them but a few iron cannons. Becka was left holding the surface marker blob as we waited for the charter boat to collect up all 14 divers from various points in the sea. You get better response from a dive kayak. When you come up it’s either there, or … it isn’t. On the last day of the conference I shoveled everything into the car, drove it round to Newton Ferrers, an inlet on the east side of Plymouth Sound, returned to Plymouth, and picked up Becka to take her out on a charter boat for an evening dive. The boat took us for a drift near Hillsea Point, and the skipper told everyone to put up their surface marker buoys as soon as they hit the bottom so he could follow us as we went with the current. Of course, no one else did except for us, and we had a hard time being dragged along by the surface current in a different direction to where we wanted to go. I’m surprised we didn’t lose our grip or suffer a line break. If the boat cover doesn’t notice this, they can chase the thing for miles only to discover you’re not there; your somewhere completely else, now without a buoy and unable to be found. 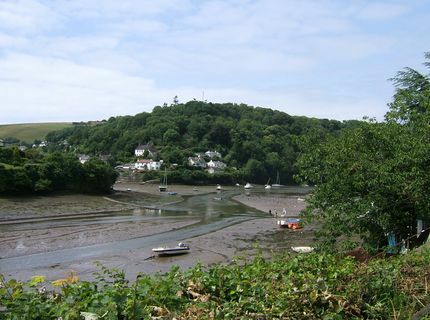 Newton Ferrers at low tide, and paddling through it at high tide. Lots of boaties live here, and the one corner supermarket has an enormous stock of booze. Newton Ferrers was a good base. It took 40 minutes to paddle the length of the estuary and get into the open sea where you would then feel the howling easterly wind. On the first day I was aiming for Hillsea Point, which is a pinnacle a couple hundred metres off-shore that reaches to within 6m of the surface and is right in the middle of the tidal current. I had been aiming for slack water, but our progress was so poor that we missed it by an hour. I managed to find the standing waves over the top of it and mark it with a GPS, while accidentally leaving Becka close in-shore and now angry because I had abandoned her by going all that way out. The wind was horrible and we had hardly made any headway, which had made her doubly cross because we weren’t getting anywhere. Fortunately, I had a back-up site further along the coast in a small bay bordered by Netton Island, just past Little Bloody Cove. According to my charts, there was deeper water in the middle of the bay relatively close to the shore (I’d had enough of shallow muddy dives that lead nowhere). It worked. The sea bed was made of shallow steps and slivers of slate on end between stretches of sand. We spent some time there, poking at a large eagle ray. By the time we got back to Hillsea Point, the wind had died down. It was six hours later and time for the second slack. We had to give it a try. The site is known as Fairyland, and it’s spectacular, with incredibly narrow cracks and vertical overhanging walls going down to 30m or more. I tried to keep us close in because we were out of our depth, low on air, and rather fortunate to be there, so it was a brilliant if short dive. The south coast is quite low on its dead man’s fingers quota (a type of white soft coral), but I did see a clump of red fingers for the first time ever. 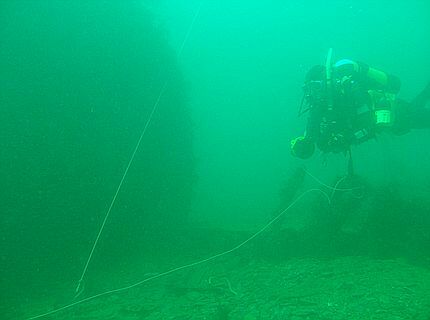 Diving the Glen Strathallen, sunk in 1970 for an artificial reef, then blown up in 1971 because it was causing an obstruction to the fishing boats who couldn’t be bothered to go round it as they seem to manage for all the other rocks in the vicinity. 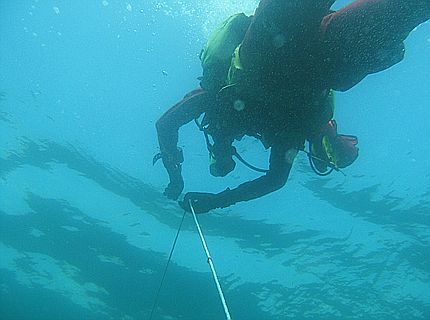 We’ve learnt to use strings and treat the anchor rope as a life-line. 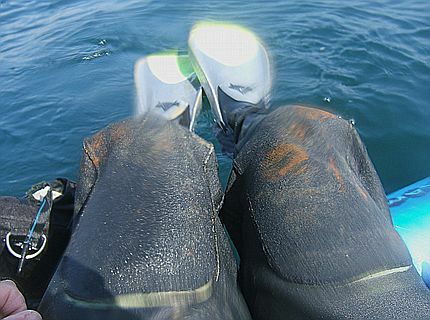 I came up covered in rust, so it must have been a good wreck dive. 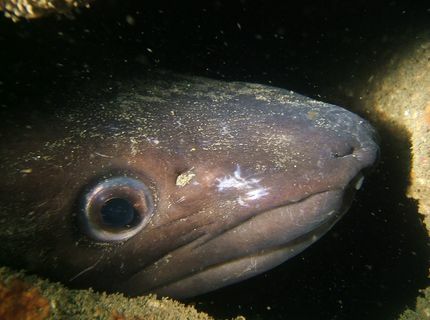 There was a frighteningly large conger eel keeping itself hidden behind the boiler pipes. The next day took us north to the Mew Stone. 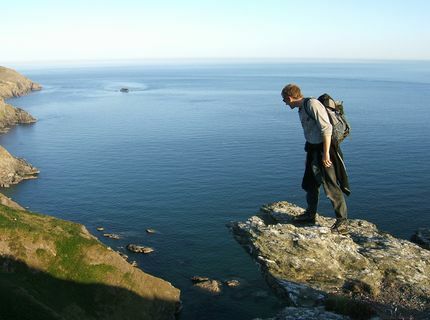 There’s supposed to be some deep ledges on the south side, but the wind and current put me off from going too far out. While we were anchored, a fishing boat drove right at us and deliberately cut us in close, evidently a little upset at us for being on his property — the sea — and happening to be smaller than him. After finding not much, we paddled over to Heybrook Bay to look for lunch, and found only flies on the rotting seaweed on the beach. Becka went up the steps to the street and found nothing available in the town but one pub. You never know; sometimes there is a small unmarked bakery with cakes. We scored our second exceptional dive, directly out from there near the Shag Stone on the wreck of the Glen Strathallen. Nice big boilers, big fish, big lobsters and a huge eel which Becka didn’t see for a while because it occupied the whole shadow. The metal was strewn over a wide area and we had a good time exploring it. I used up all my air, but Becka didn’t. 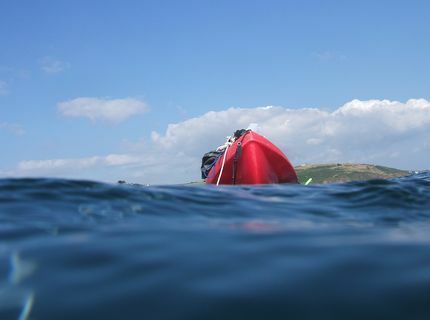 Fortunately I had a spare small tank on my boat so I could change over and try out a shallow dive somewhere at random in Wembury Bay on the way back to Newton Ferrers. This was another fantastic one. We saw eight cuttlefish at one time, and one John Dory fish, my third ever. This place too was inexplicably free of brown kelp, and there was much room for a wide variety of brightly coloured seaweeds. Our boats got lent to a couple of people I’ve tried to persuade to take up kayak diving. Unfortunately they’ve practically given up diving already. We took the day off and went cycling. 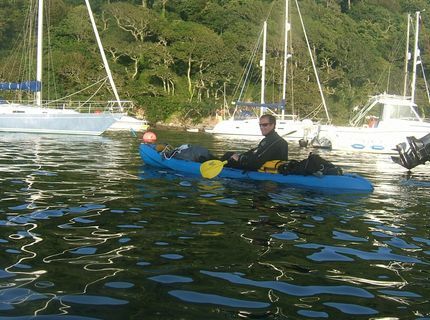 Our friends from Bristol arrived that night, and we had a kayak route planned for them from Mothercombe Beach right round to Newton Ferrers. 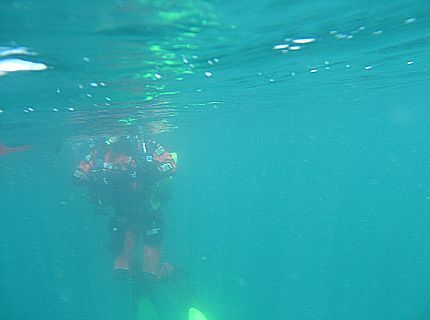 But first we were going to nip out and dive the wreck of the Persier, a mere 2km out to sea. Fortunately, my high pressure hose exploded for no reason as we were kitting up on the beach, and I had nothing to replace it with without going back to the campsite. This saved me from Becka discovering just how ambitious this plan was while we were out at sea, and getting stropped at, not to mention the difficulty of locating the wreck without a proper echosounder, and the still howling easterly offshore wind. We cleared up, went cycling, read the paper in a pub, and got back in time to see our friends arriving at the edge of the mud-flats in Newton Ferrers before the tide came in. They had to go somewhere else for another hour. It was time to relocate. In the morning we paid up the campsite (12 pounds per couple in a tent per night) and moved to another one near to Hope Cove (13.5 pounds per night) with its extraordinarily narrow lanes. We dumped our stuff, sent our friends off to explore Bolt Tail while we went for a trip with a small dive boat out of Salcombe. There were spaces free because the skipper had canceled a pre-booked weekend because he thought the weather was going to be bad. He rustled up another two divers for that day and then his boat was full. These are scenes from the shallow wreck of the Cantabria in Steeple Cove, quite some way along from Bolt Tail. This is the first time I have seen seaweed balls. They possibly say something about the conditions in this place, with a lot of rolling swell. 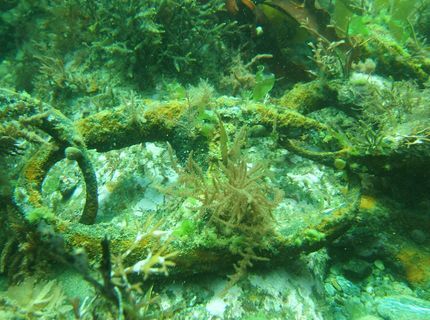 There were a couple of wrecks I wanted to do out of Salcombe, such as the wreck of the Herzogin Cecilie, but the Harbour fees were outrageous: 13 pounds per kayak just for the trip off their beach. For two of us it would cost more than to launch a smelly petrol powered boat with all the noise and trailer winching that would entail. When the revolution comes, the right to roam will extend to coastlines, and all canoes will go free because it’s practically like swimming with a stick in your hands. We got a trip out to the wreck of the Missouri, which is deep and intact but not an exceptional amount of life. I tempted Becka into a couple of swim-throughs. Then in the afternoon we had a go on the wreck of the Soudan at the mouth of the harbour, just beyond where the water stopped being cloudy and a couple of dolphins were spotted playing. Dolphins have a hard time round these places; whenever their fins break the surface, boats turn and steer directly towards them. 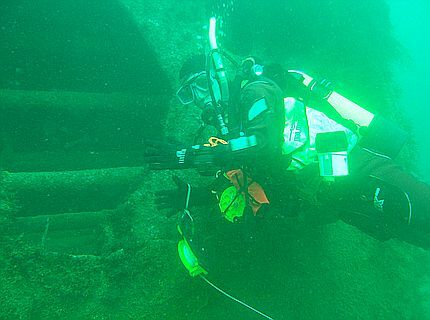 Although there was less to see of it, we really had a lot of fun exploring the wreck because we were much more comfortable. Fear is not part of the pleasure. Back at the campsite, it was a long walk down the road to the pub. If it wasn’t for the camping fees, I could have stayed all month. They are always interested in the scale of your tent because the average size has ballooned in the last few years to take up what was once an adequate space. Our tent is the smallest among the car-camping contingent by a factor of two or three these days. 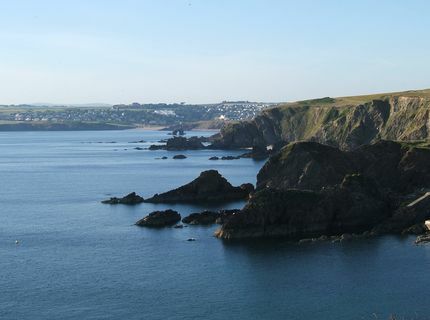 [Top Left] Bigbury Bay including the rock arch; [Top Right] Bolt Tail across Plymouth Sound; [Bottom Left] Netton Island (the jutting out rock that doesn’t look like an island) towards Hillsea Point; and [Bottom Right] Ham Stone from Bolt Tail. The Cantabria is in the next cove beyond the Ham Stone. The weather was flat calm. 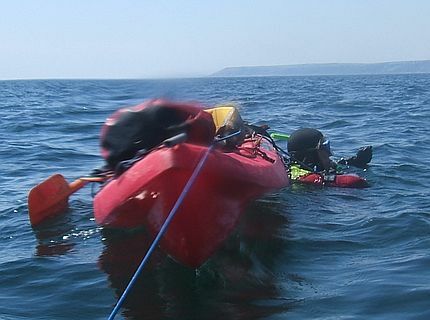 We paddled from Inner Hope Cove (after paying the launch fees of one pound per canoe), round Bolt Tail and east for 8 km to reach Steeple Cove to dive the wreck of the Cantabria. Having not read the description properly, we didn’t find the boilers or the propeller, and wasted time running a line off the anchor in 5 metres of water. It’s an excellent spot, brightly lit and without kelp. There are seaweed balls, which I have never seen before. They are not intentional like tumbleweeds because the plants don’t reproduce when they are in that state. It’s accidental, like when a few of your skin cells fall onto a lump of magic porridge and, instead of dying, grow into a tiny knot of living flesh. There are numerous deep sea caves just around the Tail, one of which goes around a corner and takes you out of sight of daylight where it is quite chilly. The cobble-stoned storm beach is extremely noisy and is frightening in the dark. There is a little sandy chamber beyond it which you can climb into at low tide. 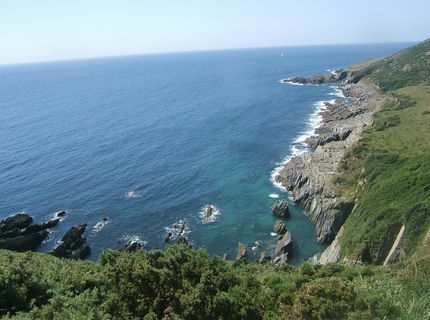 Our second dive was out from Bolt Tail within sight of Hope Cove where it happened to be slack water. The depth was 15-20m, and very colourful with lots of sponges. All of my pictures were blurred because of the lack of light. Back at the petrol station near the campsite, Becka bought a useful plastic tub for storing fruit in for about two pounds. It was unfortunately full of a litre of ice cream that had to be eaten on the walk down to the pub before it melted into a sickly milky syrup. Someone was going out for an evening paddle in a transparent plastic canoe. We struck camp the following morning and parked in Challaborough just north of Bigbury-on-Sea which overlooks Burgh Island. We paddled some way north to reach Beacon Point and Wells Rock, but it was not very interesting and full of kelp. Another kilometre or so out to sea from here is the wreck of the Persier. Back towards Burgh Island I found some rough ground in 15m using the echo-sounder and anchored. This place was excellent, with no kelp and lots of vertical slabs of rock with places for things to live. There was one lost scallop there, far from the gravelly terrain scallops are usually associated with. There were ravines you could swim across with schools of silvery sand eels. 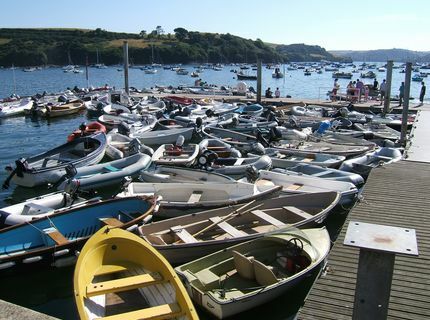 A mess of random boats swept into a corner in Salcombe harbour, and the lonely conger eel on the wreck of the Soudan. Since we hadn’t paddled the usual ten miles in the day, and had already covered the coastline in both directions, we were done in the early afternoon, and it was time to move on. Our original plan had been to stay until the weather went bad, but it was simply getting hotter. I wanted to try some sites over on the east coast out of Tor Bay. But after driving through the horrendous holiday traffic to get to the sea shore there, knowing that all the tanks were empty and needed to be filled somewhere, it was getting too much. We voted to drive home while we were ahead, and arrived before midnight. It took two days of rest to recover from this trip. Wikiscuba A new resource which everyone should be using. Totnes BS-AC club An excellent club website with lots of useful information. Underwater pics site From a guy who’s active with freediving and spearfishing and is beginning to experiment with dive kayaks. Babbacombe Beach dive cafe Has webcam with fast frame rate when it works. Deep Blue Diving Near Plymouth, where we got some of our air. The Seeker dive charter The boat we used on Wednesday night. Salcombe Scuba Small diving operation with boat spaces for four. Salcombe Harbour Website With its outrageous visitors fees tucked in somewhere. Surf Bigbury Has a webcam of the sea.